I saw this image floating around twitter this morning and it pretty much sums up what I think about technology and learning. We don’t want to use technology for the sake of having a fancy, shiny tool to bedazzle our audience into learning. Like THAT’S going to work. 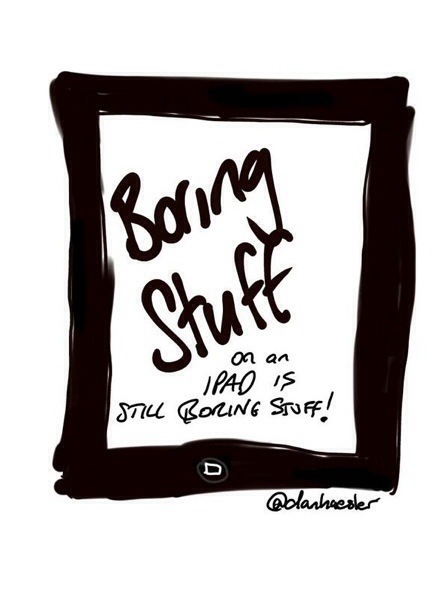 An iPad is not going to instantly transform a lesson that doesn’t connect with our learners into one that does. Really, it won’t. If we try to do that, we’ll probably end up supporting the notion that it just adds another distraction to our learners because it will offer them another way to divert their attention from the same thing they weren’t connecting with in the first place. So, allow students to use an iPad if it makes sense. But not to dress up an old lesson. The why or when to use it is really contextual. Creating, connecting, practicing, researching…these are all good reasons to want your learners to have access to an iPad. But the real questions lie around what you are expecting your learners to create, connect with, practice, and research. Does it have meaning for them?